Selling to Large Retail Chains: Why EDI and Compliance? So you've approached a large retailer and the buyer tells you he LOVES your line, but that you will need to do EDI. Now, you do not want to appear ignorant and lose credibility with the buyer, but you DO have lots of questions. What is EDI and why do large retailers have all these 'compliance' requirements? You have heard large retailer success stories, but also horror stories. How are you going get a handle on all this so you can make it work? Indeed this is important stuff. For answers, you need to understand how large retail operations work and how they are different from small stores and boutiques. First of all, retailers have to make money. To do that they focus on 3 things: margin (higher the better), turnover (fast selling/hot items), and cost control. The business problem large retailers face is that their costs are so high that on a good year they make 1 - 2% (which is really pretty astounding). So they absolutely MUST reduce costs wherever possible. When a retailer gets to the point where they have 10-15 store locations or more, they have to begin to automate to be come more efficient because doing things manually becomes more and more costly. That means computers and automatic systems and a carefully designed flow of documents and physical product into their stores. However, there is one document that is special to EDI which is the most important of all, and that is the Advanced Ship Notice or ASN. The ASN is a combination shipping document and box level packing list for each PO. Why is this important? Well, one of the largest areas of retailer expense is getting the goods from your door (as the manufacturer) to the store shelf, eg shipping, receiving warehouse/sorting, transportation to stores, etc. The ASN enables the warehouse/distribution process to be automated; without an ASN it all has to be manual. Getting goods into the stores accurately, quickly and saving as much in freight and handling costs as possible is extremely critical. So retailers who are just beginning to implement their automated systems often say "Don't worry about electronic POs and invoices just yet, but we MUST HAVE the ASN!" So what it boils down to is that each retailer sets up automated computer systems and processes to handle 1) business paperwork and 2) incoming physical product. In order for these processes to work smoothly, they require you to fit into those processes as seamlessly and efficiently as though you were their wholly owned subsidiary. Retailers give you all the specifications in their documentation, and while there are a lot of similarities, all the details are specific to each retailer (and depend on how each has configured their own internal systems). If you deviate from their requirements, they have to revert to handling your stuff as manual exceptions which is tremendously expensive for them. So they issue "expense offsets" aka chargebacks to recoup part of that cost. In many cases these can be $250 to $500 PER VIOLATION and easily exceed the amount of your invoice (!). That means that you have to plan how you are going to handle their compliance requirements, including EDI. It means knowing what pieces you will need to outsource, how it will fit into your operation, and how to shop for vendors. If you decided you needed a sewing contractor (or any other service) for your business, you would not blindly rush out and buy from the first one that came along. Unfortunately, however, many manufacturers new to EDI are so intimidated by it that they desperately sign up with the first vendor that comes along just so they can get rid of the anxiety. Remember that EDI was invented a long time ago and was basically set up to be used by large businesses. Many of the services are still priced accordingly; not only are they over priced, but they lock you in to a multi year automatically renewing contract that is very difficult to get rid of. Of course they are trying to keep you from discovering that there are better service providers out there at a fraction of the cost that do NOT require long term contracts. Also, if you will be getting 2-4 EDI orders per month (or less) your needs are going to be vastly different from a company doing 50 orders per week. So, is this EDI stuff difficult? Not at all. However, there are lots and LOTS and LOTS of details, and a whole other 'lingo' that you need to be familiar with before it all makes sense. My EDI BootCamp class gets you up to speed on all this stuff and then provides you with sample documents, examples of retailer specifications, implementation planning checklists, and even a free spreadsheet that you can use to track chargebacks (so they don't fall through the cracks and you can fix them before they repeat over and over). Note too that the retailers are vastly bigger than you are (and have a lot more lawyers). So we also talk about how to maintain a level playing field so they don't take advantage of you. Bottom line: Is it possible for any company (even a very small one) to successfully do business with large retailers? ABSOLUTELY! But you DO have to do your homework first; the retailers do not have time to bring you up to speed and learning-by-chargeback is too horrendously expensive. So for less than the price of single typical chargeback, EDI BootCamp will get you up to speed so you can start making plans to jump to the next level of business growth and success. If you want your business to move up to the expanded sales volumes that come with large retail chains, you have to have (or a solid plan to put in place) not only the production systems, but also the billing and logistics systems to match. Walmart, who is known as one of the most rigorous in terms of compliance, often tells their new vendors: "Sure we are demanding. But if you achieve compliance with us, you can be confident that you have a world class system and are ready to do business with anyone." If you approach the learning and planning process with that attitude, you can do it too! RFID & RETAILERS: Are You Ready? 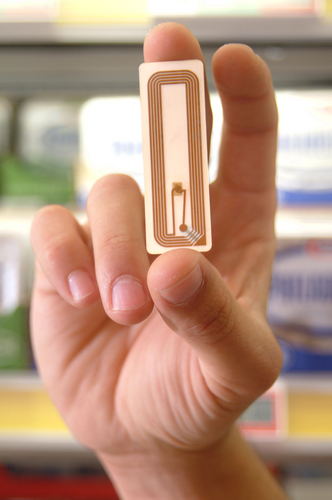 Major retailers are rushing to install RFID! Plus, Amazon has them shaking in their boots! This is why they are becoming really proactive in upgrading their systems to enable a competitive in-person shopping experience that Amazon can't duplicate. Those retailers that succeed will rise to the top and the rest will gradually fade away into irrelevance. RFID technology and EPC [Electronic Product Code] is the key to making this possible. So if your retailer specifies RFID it means that you will be able to share in their success. But it also means that you need to upgrade your operation to not only meet their requirements, but also so that you can get the benefits of RFID in your own operation as well. The key thing is that the EPC [on which RFID is based] requires not only UPC code, but also a SERIAL NUMBER for EVERY ITEM. How are you going to handle literally BILLIONS of serial numbers (AND be sure there are no duplicates)? When I began investigating this in connection with my EDI BootCamp class I discovered that gathering the information necessary to understand the technology and be able to put together an intelligent plan was a rather major project (and not for the faint of heart!). So I gathered together all the documents that you need and created an online class to quickly get you up to speed on all of the necessary background so you can create a working plan for your organization. The online EPC-RFID BootCamp class is designed to show you how you can meet this new retailer mandate. It includes complete coverage of GTINs, EPCs and RFID Gen 2 tag standards and requirements. Based on official specification documents, everything is explained in non technical easily understandable terms. This one hour interactive class (you are free to ask any questions – that’s what the class is for) will provide you all the information you need to plan your successful implementation. This class is designed for operations that are already using UPCs and doing EDI with major retailers. Persons familiar with EDI and barcodes are welcome. EDI BootCamp class gets a review! "When most start ups entertain the idea of sailing off to fame and fortune by acquiring a large store account, they idealize the process. What they really want is more returns for what they’re already doing - but that is not going to happen. Ever. If you want to move up to another level sales-wise, the process and logistics of how you service those accounts will have to move up to another level first." "One last thing bears mentioning. After having had this [EDI BootCamp] experience, I would say that no one should entertain the idea of selling clothes to department stores without having taken this class first."